Back when I was still figuring out all these investment stuff, I always have some questions that I couldn’t find in books or the people I listened to. Should I buy and hold investments for a long time? When some event happen, that affects my investments, how should my plan deviate? Should I still hold on? Should I sell or buy more? How should I size my positions in an investment portfolio, such that I do not get a large part of my capital impaired, yet not be too diversified and make my effort not worth it? Overtime, I found a metric to aggregate most of the quantitative and qualitative part of actively managed individual stock investing that allow me to answer the above questions. And when I prospect investments, all the information are aggregated to this metric for me to evaluate should I purchase, sell, hold on. It allows me to compare against other prospective investment. This metric is the Expected Return on an Investment. This article is dealing more with actively managed individual stock investing, but I think this metric is applicable to other forms of financial assets as well. 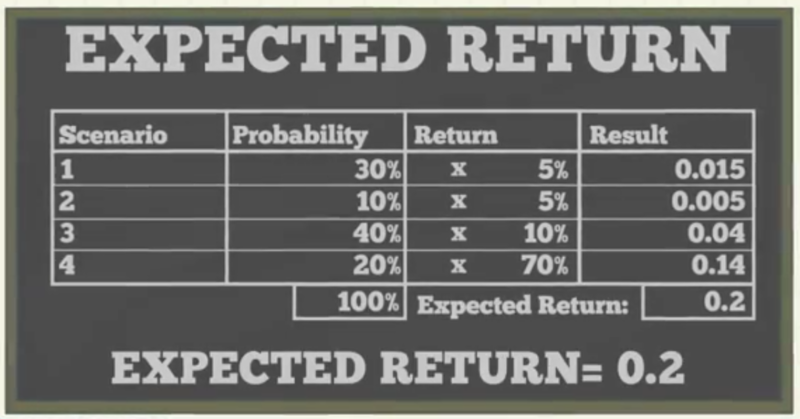 Before we dive into understanding Expected Return Model, it is better I explain briefly on Total Return. The Average Capital Appreciation or Growth of the Financial Asset in a year – suppose the asset grow x% over 5 years, we could work out what is the compounded average growth for a single year in those 5 years. Both are expressed as a percentage. When you add these 2 together, you will get the total return for the investment in a single year. When you see the Total Return in the examples in the article, I am referring to an aggregation of the cash flow yield plus the average annual capital appreciation of an investment asset. The metric that I use to guide many of my final investment decision is expected return. If you have studied higher maths or statistics at some point in school, you might heard of it. The Expected Return is the amount of profit or loss on a single investment based on the returns of various investment scenarios that single investment could undergo. We multiply the potential outcomes of each investment scenarios with the chances of that investment scenario occurring, aggregate them up, to come up with an expected return. 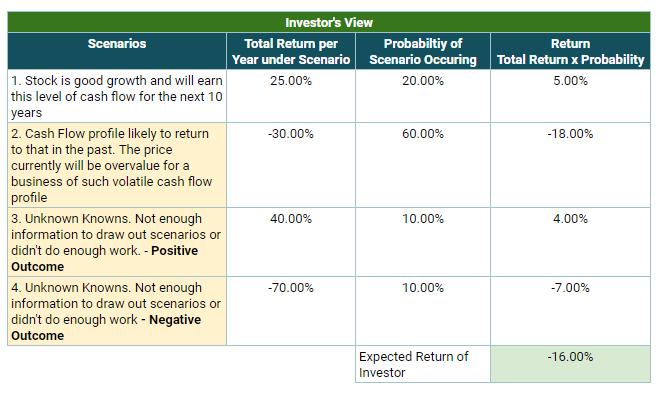 Chances or Probability of each investment scenario happening, when add up must equal to 100% or 1. The expected return is usually express in percentage. It will be rather dry and hard to understand if we talked about the definition, so here is an example. SIA Engineering is one of the reliable company listed on the Singapore Straits Times Index. It carries out Maintenance, Repair and Overhaul (MRO) mainly for SIA, but also some airlines that make a pit stop in Singapore. For some time, it was known as a reliable business with a competitive edge. While it has a competitive edge, you are paying a rather dear price for it. For some time, it has been trading at 20 times PE, or it has an earnings yield of 5%. Organically, the growth of SIA Engineering should be pretty similar to GDP growth of 3%. This gives it a total return of 8%. This is the core baseline scenario. Another scenario that could be possible is that, Changi Airport develops further, more airlines stop over and more potential contracts for SIA Engineering. In this case while earnings yield is still 5% at this price, the growth rate could be 5%/yr. This gives a total return of 10%. The last scenario that could happen is that, the OEM companies are interested in this lucrative business and competes with SIA Engineering. Since SIA Engineering have particular dependency to the OEM in their existing work, the OEM could come up with very unfavorable terms such that SIA Engineering is always at the losing end. In this case, the business might be adversely affected. The realistic cash flow yield is reduced to 3%. The growth rate over the next 10 years is -2%/yr. The total return, under this scenario is 1%. Based on our qualitative work, we determine particular probability each of these 3 scenarios will occur. 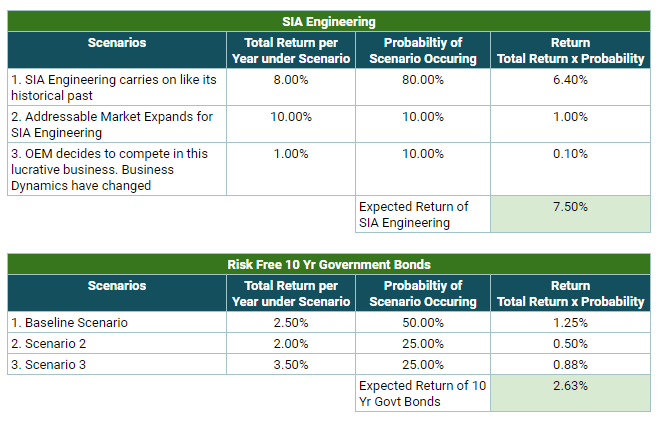 The Expected Return on SIA Engineering is computed as (8% x 0.80) + (10% x 0.10) + (1% x 0.10) = 7.5%/yr. This expected return is more than zero, which means it is a positive expected return. By this point, you should have figure out mathematically how to compute expected return. I wrote about risk in investment and wealth management in the past. You can read my mammoth article on it here. Risk, in short are deviation from the original intended outcome. The outcome in investing is that you have a particular expectation of the total return. The alternate scenarios, can be seen as positive deviation (risk) or negative deviation (risk) from this particular expectation. Many of us associate risk with negative outcomes. There are positive outcomes that you have not think of as well. By factoring the various scenarios, we hope to cover, to a good extend what could happen to our investment return. When you have worked out the Expected Return for an investment, you have something that can compare this investment, at this point in time of evaluation to something else. When we evaluate a stock, we are comparing where and how best to deploy our capital. 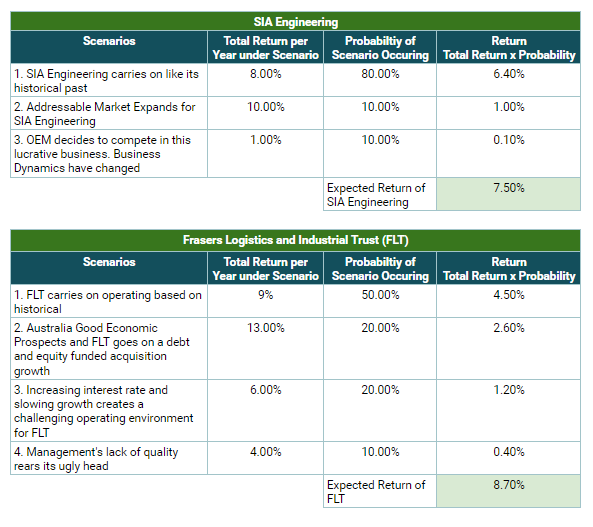 SIA Engineering and Frasers Logistics and Industrial Trust (FLT) are very different monsters. Despite that, as an investor, we are evaluating where best to deploy our money. 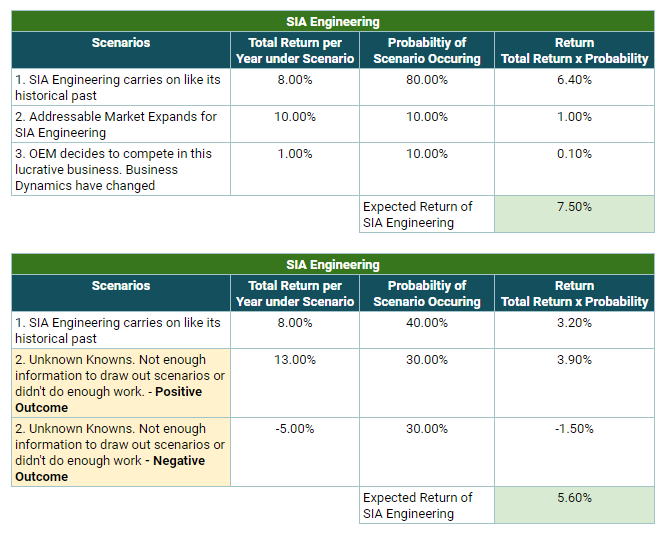 A sound evaluation of the scenarios and the return outcome of each stock allows us to come up with an expected return. We will be able to compare, factoring the potential growth, potential decline possible for each stock, which one is a better deployment for our capital. SIA Engineering do look like a good investment if we look at it on its own, but when we put it against FLT, a current investment holding, it might not look as appealing. It might in turn tell you that your capital is better, staying (or even adding on) to your existing FLT. Your evaluation is not just constrain to 2 stocks. It can be between a stock, a REIT versus another investment assets such as an investment property. In the table above, an investor compares his decision to plonk down $300,000 into SIA Engineering, versus putting the $300,000 into a residential investment property on leveraged. For simplicity there are 3 scenarios, the baseline, where the growth rate is moderate at 3%, and the owner services its mortgage in full by rental. There is the more sanguine scenario 2 and the pessimistic scenario 3. The probability of each scenario occurring will depend on the investor’s purchase price versus value, climate, and future outlook. The Expected Return is 4.3%. When put against SIA Engineering’s 7.5%, SIA Engineering looks a better place to deploy the capital. This is a straight up evaluation of whether we should buy or sell. You might find it strange because cash expected return should be rather low. It could be 0.25%, or if you put your cash in short term savings instruments that I introduced here, your expected return may bump up to 1% to 2.5%. A lot of financial assets could beat this handily. This is not always the case. Depending on your purchase price versus the intrinsic value, the future outlook, your expected return could be negative. 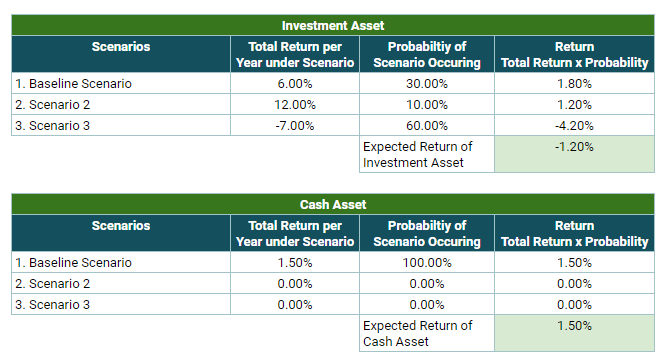 In the table above, the cash asset have an expected return of 1.5%. The investment asset that the investor wants to purchase have a baseline outlook, a more positive and negative outlook. The devil is in the probability each scenario will happen. A mistimed purchase may result in the expected return to be negative. In this case, this turned out to be a bad investment. I will elaborate more on this in a section below. Comparing against cash most of the time look more extreme. In most cases, investors compare against the risk free rate, which we normally use a certain 3 year or 10 year duration government bonds. Particularly, we could identify the current spread between our investment asset and the risk free asset. Overtime, we would be able to know whether this expected return is higher or lower than historical spread. This form of evaluation is more useful for interest rate sensitive assets such as bonds, REITs and business trusts, telecom stocks. As stock investors, when we invest, we would want to ensure that we get a decent return versus the opportunity costs of putting our money elsewhere. And that can be putting our capital in other stocks. Thus one measure is against the cost of equity, or how much equity in general cost elsewhere. When we work out our expected return, together with our profile of this stock, we can determine if this stock is attractive versus the opportunity cost of not investing in this stock. What do you need in your Stock Prospecting Tool Box to work out the Expected Return? Since the expected return is an important part of my evaluation process, we need to be able to put the figures into the tables you see in the example. To work out the various scenarios, you need to have a certain degree of understanding of the business or the nature of the investment asset. The majority of the work I do here is to read through the underlying business of the stock, or the asset class to understand how they work to a particular level. This is the qualitative part of the work required. Then we review the financials of the business or if it is not available, we compile the financials gain an insight how have the business perform in the past, and the nature of the business from the numbers perspective. This is the quantitative part of the work required. For example, the financial snapshot above is of a listed company in Singapore. The financials gives us a picture of the nature of its revenue, expenses and profit. It manages our expectation whether recent good profit is something out of the ordinary. Good businesses or business with good managers over a long period should show its quality in its net profit. In this case, a review of the result would show that there are some years in 2009 to 2013 where net profit dipped from a high of 8.8 mil in 2008 before returning to the same levels in 2014. This may tell you that earnings are not so consistent, and going forward what are the possible scenarios. Is the profit we are seeing this year high in a very cyclical industry? Or is this profit going to be consistent due to a change in dynamics of the company or the industry. For this, you would need to understand more of the nature of the business and industry. The deeper you do the qualitative and quantitative work, the better picture you form. You can come up with more possible trajectory for this stock, and identify its total return better. Probability of each scenario happening can be subjective and its also a function of your feel of your work. When there is an Absence of Scenarios. What do I not know! If you do not do the work, or have not form a good picture, you might not come up with many deviating outcomes. In some businesses, no matter how much work you do, you will feel like there is much about this area that you are not sure about. This is normal (provided you know you are rather competent in investing, and have done the prospecting work required). Knowledge in various areas can usually be group into the above 4 groups. The first group are the information, data, knowledge that people know and that you know as well. The second group are the common information, data, knowledge that most people know they have a difficulty to find out and you are aware of that. The third group is the information, data and knowledge people are aware of, but not to you (for some reason due to yourself or high search costs). The fourth and last group is the information that nobody knows at all. A deep qualitative and quantitative prospecting work will suss out the first and second area. The challenging part is the third and fourth area. The fourth area is something that is tough to see. However, you can control this by either staying away, or be diversified enough so that this single collapse do not impede your current and future living conditions. The third group is the subjective one, depending on whether you have prospect well enough, or whether information is readily available. The translation to expected return for SIA Engineering is as above. Your expected return becomes more volatile because it could end up as a good outcome or a bad outcome. For each the total return and the probability of them happening is unknown. We are at the tail end of 2014. Upon seeing the growth of cash flow announced from $8 mil to $14 mil, the share price of this stock surprises on the upside. Based on the $14 mil cash flow earned by the stock, the share price is not expensive at all. When the result shows that future cash flow is not going to grow upwards above $14 mil, the share price will plunge accordingly. The future cash flows shows a return to the 2008 to 2011 period. The investor fell into a valuation trap because of unknown knowns. Inadequate information, due to his or her competency, results him in having a distorted expected return model. He or she has the view that the cash flow profile will stay at this range or higher. The total return is expected to be 2% cash flow yield + 23% capital appreciation. Since there is no alternate scenario, his thinking is that his expected return is 25%. Could we have Averted this Loss of Capital with more Prospecting Competency? In this particular example, we could. Business is very order-book based and 2 to 3 years of good results is common. Longer than that is hard to predict. The expected return that you could then come up with will be very different. You would realize the great growth scenario’s probability is much lower. There could still be a possibility of a bigger upside (scenario 3), but in all likelihood scenario 2 is the dominant outcome. Conviction refers to the belief that we have. In investing context, it is how high or low of a belief in our investment thesis. I can honestly tell you, conviction shifts. Conviction changes the more we reflect on our investments, and the more prospecting work we do. It also changes when new information and knowledge comes about. When conviction level changes our Expected Return Model also changes. One realization investors that started their journey may not realize is that the nature of the business and its interaction with the environment changes, and so the value of the business also changes as well. They wanted some valuation metrics to let them know if a particular stock/business is good to buy or not. How they view these metrics is that the metrics are static. That is not the case. Stocks shift from cheap to expensive, stay expensive, then becomes cheap. Intrinsic value is volatile. The evolution of prospecting a stock/business that is first unknown to you usually go like this. 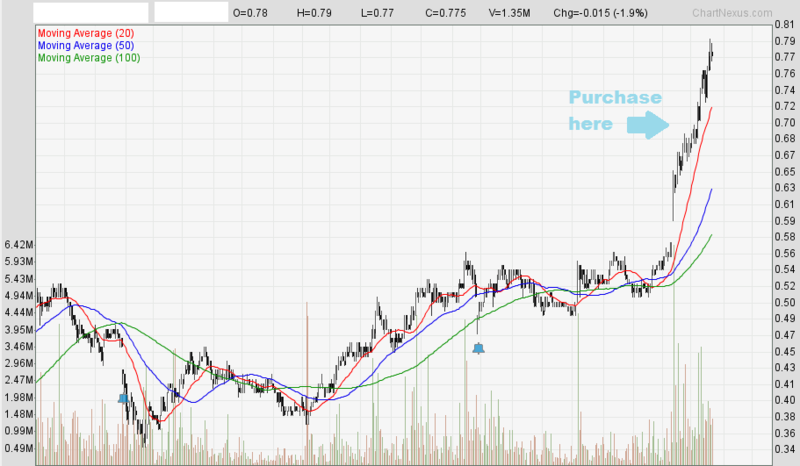 I first invested in Straco, which is a small company listed on the SGX at $0.17. When its price almost doubled, I added a bigger chunk of my money. Then when it doubles again I added more but in lesser quantities. The share price rose hit $1, and now its languishing at the price that I last added at $0.76. At the start, I wasn’t as competent as an investor compare to now. That is one factor. While I did a lot of the quantitative and qualitative work, there is much I still do not know about Straco to form a better picture. The total returns look good at 10% but because there are much unknowns, with an emphasis on negative unknowns, the expected return model actually shows slightly positive. When the share price reaches $0.30, more information is revealed to me. Some of the past uncertainties, or potential negative and positive outcomes become clearer. I also reached a stage as an investor where I was better then in the past. While Straco’s share price have doubled, which makes the total return based on historical less (scenario 1), I also gain an understanding that the cash flow growth rate are stronger than I expect when I first look at it at $0.17. I also got an opportunity to attend AGM, talk to the CFO and did more research on my own to realize there are much competitive advantage to its current business but also more opportunities. The result of this is that scenarios 2,3 and 4 appeared. They are both positive and negative. Even the negative scenarios would likely affect the business in the short term. As more scenarios are uncovered, the probability of Unknown Knowns ( scenario 5 and 6) went down from 60% to 13% relatively. The expected return in this case is near 9% which is more compelling then the original amount of nearer to 0%. It makes a more compelling purchase. At this point of $0.76, which is the price that I last added, is it as compelling a purchase to add compared to last time? If we look at how the total return and the scenarios, organic growth have slowed down for the aquariums. Thus the total return for the baseline (scenario 1) is less than previous. This is based on some past recent growth rates from financial reports. We also realize that the cash flow build up, needs to replenish the Shanghai Aquarium, whose lease ran out in 2035. So the cash flow will go towards replenishing this asset. The return on invested capital on new projects now won’t be as rock solid than Shanghai Aquarium or Xiamen Underwater. So the potential replacement also slows down. Changes to China’s migration policy have largely factor into the baseline scenario, so the probability is zero percent. The expected return is 4.7%, much less than last time. However, expected return is still positive. My evaluation would be to look at this versus some other stocks and their expected return. 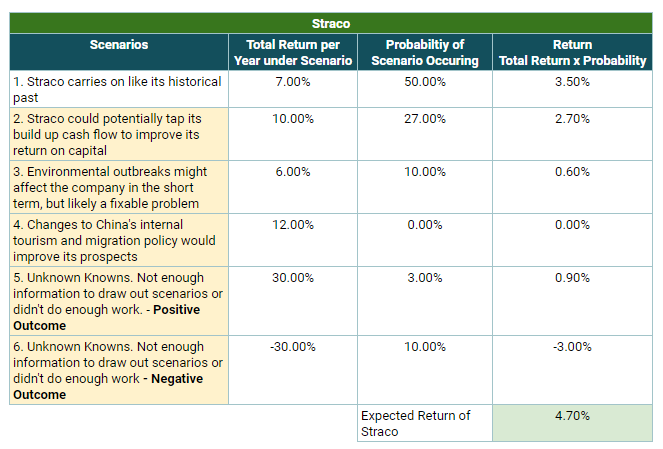 However, the upside of reinvesting into Straco is that I know it better now, and there are less uncertainties versus an investment that looks good on paper a tremendous upside but with more unknown outcomes. How do you Size Each Position in your Portfolio? Building on to the case study for Straco, your conviction for an investment will shift. Your knowledge on the investment will also improve, if you delve deeper into it. The expected returns will also shift. This sounds good on paper, but as I have illustrated, most work will be in the background where you are drawing a picture of the investment. If you add more while there are more uncertainties, you are doing some dangerous gambling. Could turn out very well or very bad. Some peers with high conviction could dare to put 50-75% of their portfolio into a single stock, because they make that stock their whole world. They spend like 80% of their maintenance and recurring investing efforts daily or weekly thinking about the scenarios and perspective on that one stock. They are basically work as close to the owners as possible. How do you Sleep more Soundly at Night? Many people say sell down to your sleeping point. I feel this is not wrong. However, your sleeping point will shift due to the level of clarity you have in stock prospecting and the investment. Feeling Anxious is Not a Bad thing. Yes it affects your health. However, it is that voice inside that asks the question: Have you done the adequate work required? Why do People like to Invest in a Bear Market? I know there are investors who are waiting for the bear market. Then they will plonk down all their money. They are waiting for 8 years almost. Why is it so good to invest in the bear market? The Expected Return Model explains this well. Those companies who have their shxt together will be available for all to see. While the stock price has fallen, and so does the underlying earnings or cash flow, you would be able to find stocks with a combination of good cash flow yield and good future appreciation. This is a function of how cheap the price is. More importantly, for most of these businesses, if you have doubts about their survivability as a business, much will be answered in a tightened operating environment. 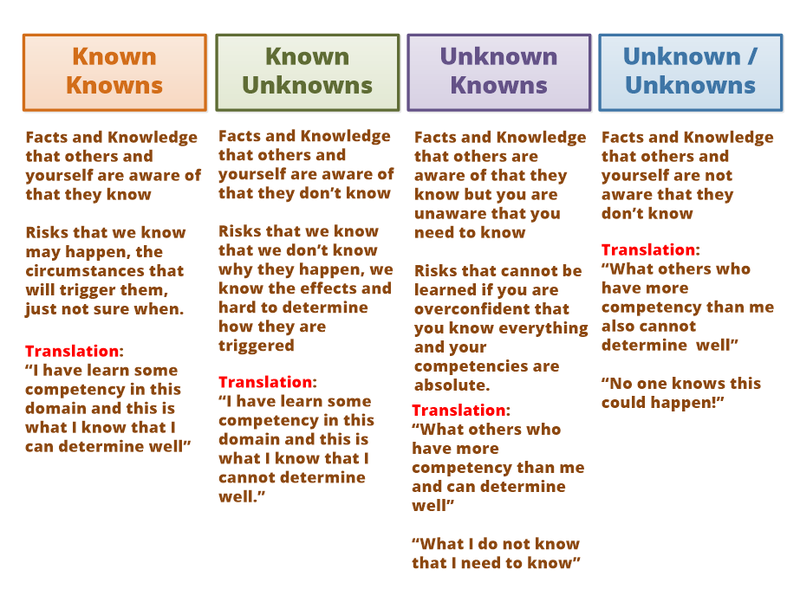 The Unknown Knowns to you, becomes much less. The expected return is higher. And it is why stocks that are prospected well are like fixed deposits in the future. The emphasis is on prospected well, because there are many stocks that have their price fallen, but showed bleak future. What you should watch out for in a Bull Market? In a bull market, or in a latter stage. The inverse of the bear market case will happen. For those with competency, they will still be able to find good businesses to invest in, or special situations. However, in a market that is optimistic, there are likely to be much uncertainty how well the company does when credit tightens and operating environment becomes challenging. This is more so for those companies that were recently listed with very short open operating history. Thus in the bull market, tamper with your expectations. You have to sense how much uncertainty you have considered and the impact to the business. You might be better not investing, or to put in a smaller position. 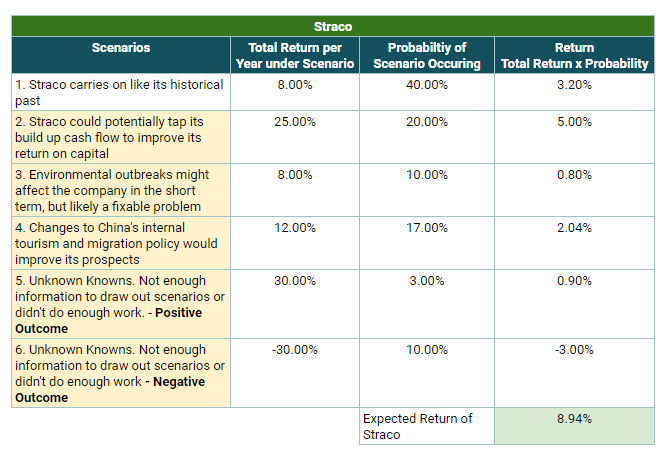 Much of the stocks will look like Straco in my early stage, where there are much unknown knowns. The game plan then… is perhaps to be ready to sell when fundamentally it does not look right. Pull the trigger faster with more unknowns and observe on the side lines. You might be thinking, do I have to do this for all the investments that I am considering? Calculating probability of the outcome is subjective. I mean, how do you attached a figure to some events? In project risk management planning, we typically use rounded up digits such as 10%, 25%, 35%, 70%. However, we are still basing the tangible figure on our gut feel of how likely that outcome will happen. We could draw upon the frequency of past incidence of the business we are prospecting. However, the awareness that there are multiple scenarios, and that some scenarios you may not see if you do not do enough work, and the need to work out the returns that you will get are important. Going through this process moves the investment to some closer to whether you owned a golden goose, or a normal goose masquerading as one. How is the valuations and the total returns on a potential investment now? Am I buying leaning towards expensive, cheap or rather fair? How does Valuation Matters in the Expected Return Model? Working through various scenarios let’s me know how much uncertainty at certain point. If there are more uncertainties than we are comfortable, we hope that the potential return is at least high enough to compensate for not knowing so much. When we work out the total return, we could then compare against the returns for the business that have a similar profile. Businesses with better quality profiles we can afford to pay a higher multiple (but also not too high), while businesses that are volatile we have to be more vigilant with our holding period and the price we pay. There are many forms of valuation metrics such as Price Earnings Ratio (PE), Enterprise Value/EBITDA, Enterprise Value/Sales, Price to Book (PTB). Inverting some of these metrics gives us an idea how much earnings yield / free cash flow yield we get for the business versus historical, other prospecting stocks, cost of capital. If the yield is low, we often inserts in scenarios where the earnings currently are at peak and likely to be lower for the next 5 years. That will lower the eventual expected return and affect our investment decision. The Expected Return Model is not for everyone. It is more so of an explanation of how I look at investments in general. This is applicable whether it is REITs, investment property, stocks, managing a passive portfolio. We are always looking for a positive expected return in anything that you invest in. I mean, that is why most people want to put their money in fixed deposits isn’t it? The expected return you know is positive. We invest in stocks, properties expecting that our returns are at least positive. However, as I have shown, when you move above the risk free assets, there are uncertainties in investment. Not doing adequate work lets you fall into the trap that you have a lemon masquerading as a sure thing. I should also add, it doesn’t mean that you do all the work and you can weed away the lemons. This process I believe is proven to work, however there will be the odd blow ups. You have to trust the process. If this is confusing for you, may I refer you to the thought process used by my peer B, who have a much simpler X + Y + Z = Total Returns model. Let me know if your thought process is vastly different from this or somewhere along the same lines. Looking at your portfolio holdings summary and transactions, your track record speaks well of your investment decision thought process. Your losses are minimum and at maximum < $1.3K for the not so many bad counters. Wonder if you can share your thought process how you maintain minimum losses in your investments. I think my thought process is the same. This expected return model is what I based upon. A lot of the work is identifying the scenarios, and how comfortable I am knowing what i know, what i don’t know, what i know i don’t know. Depending on this, the expected returns are different. Something that have high return, with greater uncertainty, have a low expected return. Holding and watching it will be longer. I guess i am more risk adverse, so I missed out on a lot of stuff. But what I hold longer they tend to do ok over time. There are fundamental speculations on special situations as well, and those… i am more watchful over them. I am just lucky in this period. But I also have good folks who discern some fundamental scenarios not many talked about. That is why I stayed away from the marine, commodities and oil and gas “good” businesses.